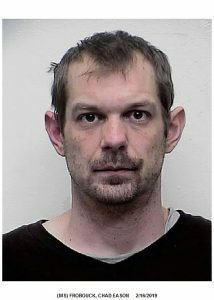 On February 15, 2019, it was reported to the Sheriff’s Office that a male, identified as Chad Eason Frobouck, 40, of Hagerstown, was attempting to hire someone to commit a violent home invasion and robbery. A Detective communicated with Frobouck, and Frobouck solicited and conspired for the crime to happen. Frobouck wanted a picture of the intended victim tied-up to prove the crime happened. Detectives were able to stage a crime scene that made it appear the home invasion happened and the intended victim was tied-up. Frobouck was contacted and Detectives arranged a meet-up with him in order to receive payment. Frobouck was taken into custody without incident at the designated meet-up location. Frobouck has been charged with Solicitation/Conspiracy to Commit Home Invasion. Frobouck is currently being held at the Washington County Detention Center on no bond. On February 13, 2019, at 7:11 PM, deputies were responding to a call for service on Paradise Drive, Hagerstown, MD. One of the parties involved was identified as Steven Lawrence Herson, 71, of Hagerstown. While traveling westbound on Longmeadow Road, west of the railroad crossing, a responding deputy located an older male, dressed in dark colored clothing, lying on the side of the roadway. The male was later identified as Steven Lawrence Herson. It appeared Herson was struck by a motor vehicle. The deputy administered CPR to Herson until EMS arrived on scene and took over care. Herson was transported to Meritus Medical Center, where he later succumbed to his injuries. A witness on scene stated that they believed a dark colored sedan had struck Herson and left the area. Approximately 20 minutes after locating Herson, a male approached deputies and stated he was the driver of the vehicle which struck Herson. The driver was identified as Anthony Lamar Fugate, Jr, 18, of Pennsylvania. Fugate was operating a 2010 Nissan Maxima. The Accident Reconstruction Team was called to the scene and is investigating the accident.